Present at the launch with the Lord Mayor, were: Grace Murray, Breda Ennis, Aaron O’Shea and Michael Linehan along with Lisa O’Shea and Julie Slattery, Community Rehab Officers. A group of survivors from Headway, Brain Injury Services & Support, have launched a fundraising campaign for a new €2 million state-of-the-art brain injury recovery centre in Cork. The campaign launch was held at Cork City Hall in the presence of the Lord Mayor of Cork, Councillor Mick Finn, as part of National Brain Injury Awareness Week, a nationwide campaign to raise awareness of brain injury and to give a voice to those affected. At the end of 2018, Headway purchased a site on the Carrigrohane Road which the organisation has been renting for a number of years. Headway’s ambition is to merge its current services in Ballincollig and Carrigrohane, to deliver a rehabilitation centre for people living with brain injury on the Carrigrohane site. 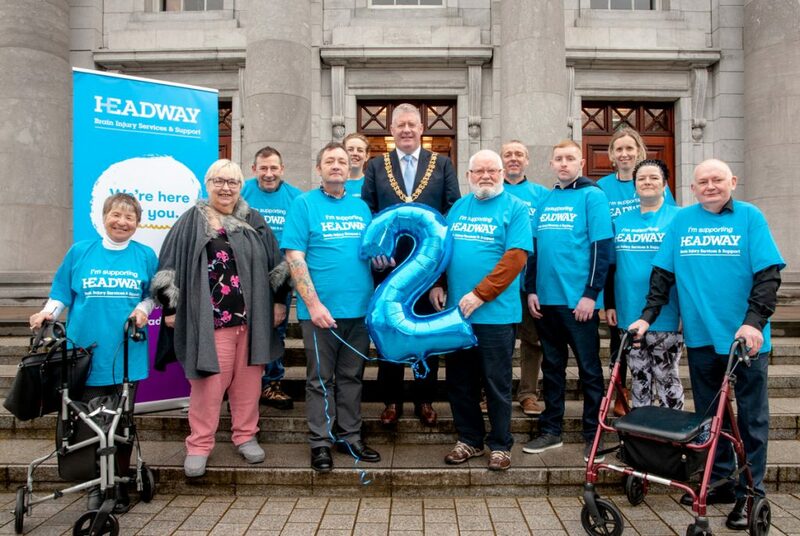 A group of survivors from Headway, Brain Injury Services & Support, today launched a fundraising campaign for a new €2 million state-of-the-art brain injury recovery centre in Cork. The campaign launch was held at Cork City Hall in the presence of the Lord Mayor of Cork, Councillor Mick Finn, as part of National Brain Injury Awareness Week, a nationwide campaign to raise awareness of brain injury and to give a voice to those affected. Present at the launch were: Cllr, Mick Finn, Lod Mayor of Cork with Richard Duncliffe, Breda Ennis, Cathy McCarty, Julie Slattery, Community Rehab Officer, Walter Bermingham, Aaron O’Shea, Michael Linehan, Grace Murray, Christopher Hopkins, Owen O’Driscoll and Lisa O’Shea, Community Rehab Officer. 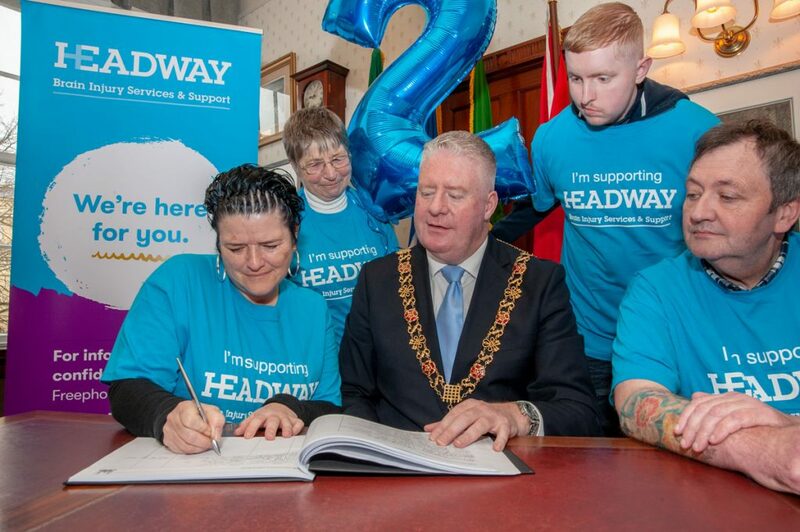 “I am delighted to support Headway’s fundraising campaign to develop a much needed brain injury rehabilitation centre in Cork and I would encourage the people of Cork to get behind the fundraising campaign,” urged Lord Mayor, Councillor Mick Finn. 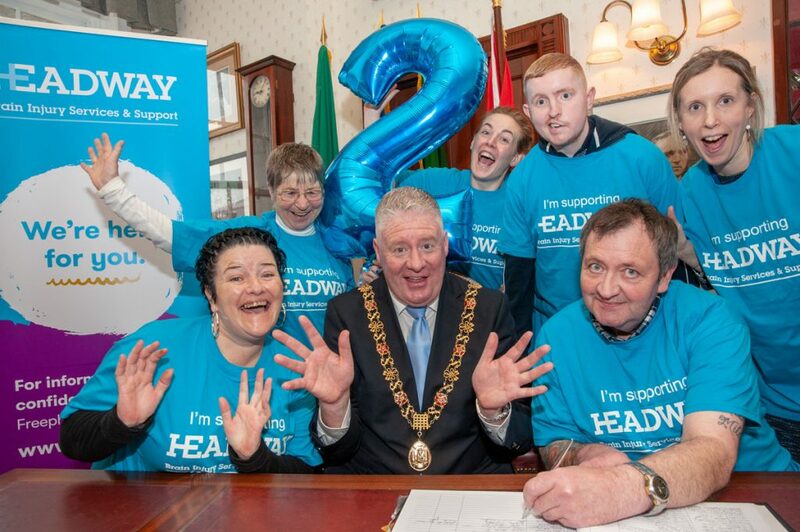 “I can announce that I will provide some funding from the 2018 Lord Mayor’s Christmas Concert to set the ball rolling and I’d encourage the people of Cork and businesses community in Cork to support Headway’s expansion plans.” continued Lord Mayor, Councillor Mick Finn. A group of survivors from Headway, Brain Injury Services & Support, today launched a fundraising campaign for a new €2 million state-of-the-art brain injury recovery centre in Cork.The campaign launch was held at Cork City Hall in the presence of the Lord Mayor of Cork, Councillor Mick Finn, as part of National Brain Injury Awareness Week, a nationwide campaign to raise awareness of brain injury and to give a voice to those affected. Present at the launch with the Lord Mayor, were: From left: Grace Murray, Breda Ennis, Aaron O’Shea and Michael Linehan. 100% of all money raised through the fundraising campaign will be ringfenced for the development of the Cork centre which will provide support and assistance to individuals and families in crisis. Each year the centre helps over 350 families affected by brain injury. The existing service is already stretched to the limit. An extra 100 families need our help currently. And the demand is still growing. We urgently need this centre. For further information or to contribute to the Cork Headway campaign, go to www.headway.ie/get-involved/support-our-campaigns/cork-capital or call 1800 400 478.